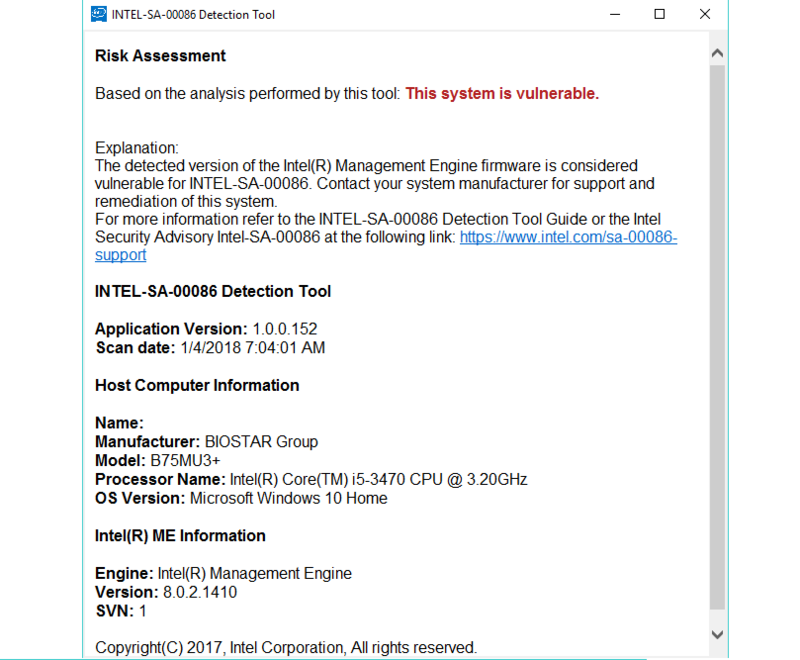 The INTEL-SA-00086 Detection Tool will assist with detection of the security vulnerability described in INTEL-SA-00086. Read below for more information. This download contains two versions of the tool. The first is an interactive GUI tool that discovers the hardware and software details of the device and provides a risk assessment. This version is recommended for a local evaluation of the system. The second version of the tool is a console executable that saves the discovery information to the Windows* registry and/or to an XML file. This version is more convenient for IT administrators wishing to perform bulk discovery across multiple machines to find systems to target for Firmware updates. The version of the tool is a command line executable that will display a risk assessment for the system being tested. Note: Versions of the INTEL-SA-00086 Detection Tool earlier than 1.0.0.146 did not check for CVE-2017-5711 and CVE-2017-5712. These CVE's only affect systems with Intel Active Management Technology (Intel AMT) version 8.x-10.x. Users of systems with Intel AMT 8.x-10.x are encouraged to install version 1.0.0.146, or later, to help verify the status of their system in regards to the INTEL-SA-00086 Security Advisory. 954 2,738 Intel <img src="https://www.oldergeeks.com/downloads/gallery/thumbs/IntelSA00086Detect_th.png"border="0"> Apr 04, 2019 - 11:39 1.2.7.0 950.8KB GZ , out of 12 Votes.